A copyright case about a lullaby used on The Big Bang Theory has been dismissed by a judge. Characters on the hit comedy usually sing the song – with lyrics starting “soft kitty, warm kitty, little ball of fur” – when one of them is unwell. But according to the daughters of a teacher who brought the lawsuit, the words were used without permission. Ellen Newlin Chase and Margaret Chase Perry had said the show should have bought the rights to the lyrics. Their mother Ellen, a nursery school teacher from New Hampshire who died in 2004, was said to have written “soft kitty” as a poem in the 1930s. 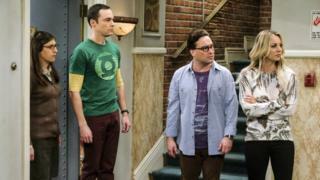 The legal case, brought against network CBS, said The Big Bang Theory had used the lyrics on at least eight episodes, since March 2008. CBS was sued for copyright violation in 2015 but a New York district judge has now dismissed the case. In the show, Sheldon Cooper (played by Jim Cooper) describes how his mother used to sing him the two-line song – ending with “happy kitty, sleepy kitty, purr purr purr” – when he was ill. The song has been been featured on Big Bang Theory merchandise, from T-shirts to fridge magnets. According to the dropped lawsuit against Big Bang Theory, Warner Bros. Entertainment and the show’s other producers sought permission in 2007 to use the lyrics from Willis Music Co – a Kentucky-based company that had published them in a book called Songs for the Nursery School. But, according to the claim, Willis Music gave permission to use the lyrics without consulting Mrs Newlin’s heirs even though the book makes clear that Mrs Newlin was the author and owned the copyright to the lyrics.